The AR.Drone remote-control quadricopter is a groundbreaking device combining the best of many worlds, including modeling, video gaming, and augmented reality. 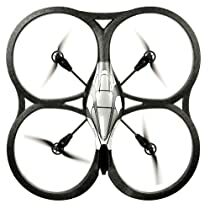 The AR.Drone is remote-controlled by an iPhone and features a number of sensors, including a front camera, vertical camera, and an ultrasound altimeter. The AR.Drone can also be used in video games, such as AR.FlyingAce, a dogfight between two AR.Drones. A groundbreaking device combining the best of many worlds, including modeling, video gaming, and augmented reality. Tags: Helicopter Parrot AR Drone R.C.